We were dubbed The Macaroon Gang by one of the husbands of our little group, incredulous as he was that his wife and her food-obsessed buddies would devote an entire day to tracking down macaroons on the Lower East Side. But by then we had our route plotted out, starting at the little shop that stocked barrels of fresh, moist, densely sweet coconut macaroons for Passover — in plain, chocolate-dipped, chocolate chip, and chocolate dipped in chocolate — then heading down the street to the kosher pastry shop, the dried fruit and nut store, the matzoh factory, and the pickle man, for fresh horseradish (grated into a barrel by a guy on the sidewalk wearing a gas mask). It mattered little that only one of us was Jewish and actually needed some of the items for her Seder dinner. We’d fallen in love with those coconut macaroons from the LES and brought back bags full. Alas, all of those iconic little LES shops have disappeared, their scuffed and worn storefronts turned into glass-box boutiques and coffee houses of a now thoroughly gentrified area. Coconut macaroons, on the other hand, remain a staple around Passover in New York. They’re likely produced by the same companies, although shed of the requisite trek to the old neighborhood, they’ve somehow lost their magic. 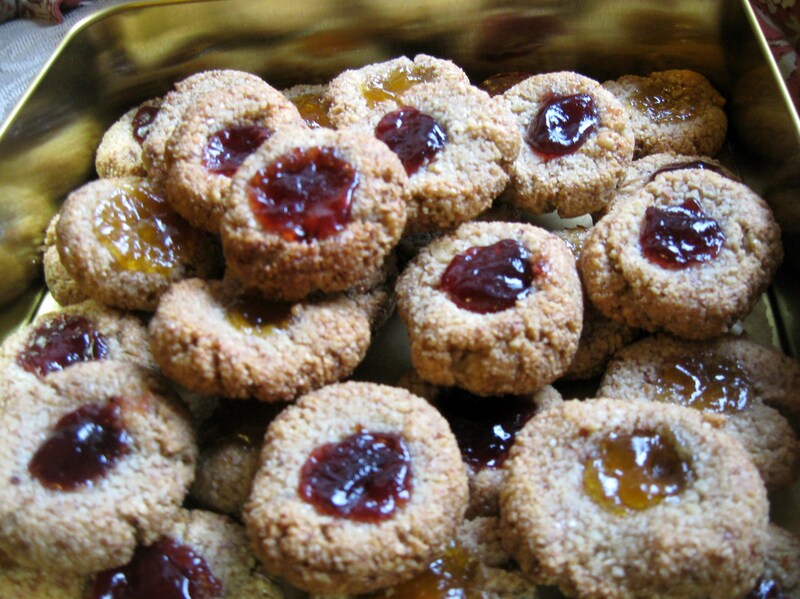 So this year, thoughts have turned to another macaroon variant for Passover, made with ground almonds and walnuts instead of coconut, and topped with bit of jam to make the cookies glisten like little jewels. This recipe, courtesy of cookbook author Joan Nathan in The New York Times, puts a Baghdad spin on things, with cardamom as the main spice, and a touch of rosewater in the finish. The only other ingredients are sugar and egg, just like basic coconut macaroons (not to be confused with the trendy French macarons), and they can be, in fact, should be, mixed in one bowl by hand. The process: incredibly simple. The results; hauntingly aromatic. Tip: Be careful on the baking time, as these cookies can quickly become too brown and dry. Remove from the oven when they still look slightly underdone, and they will stay tender and chewy. I saw the same article on NYT. I was wondering how they would work out. Glad you took the time to investigate. They look beautiful!